Ahwazi activists have voiced their outrage against a documentary broadcast by Iran’s Press TV that used televised forced confessions by political prisoners to construct an outlandish conspiracy theory. The Iranian government’s propaganda mouthpiece Press TV broadcast a documentary on 14 March claiming Ahwazi Arabs were “simple people with simple minds” and therefore vulnerable to mysterious “mind termination” brain washing techniques that turned them into violent unthinking killers. Using theories of cult indoctrination devised by American psychologist Steve Hassan, the documentary claims that cult-like brain-washing techniques were used by individuals living in Denmark and Canada to involve Ahwazi Arabs in armed separatist groups. The ideology of the former Iraqi Ba’athist regime is cited as a method of attracting Ahwazis into psychological mind manipulation. The documentary implies that Arab social backwardness and psychological vulnerability makes them vulnerable to brain-washing and manipulation. The documentary goes further, suggesting the foreign-based commanders are also themselves victims of ‘mind termination’ by higher powers and implying the involvement of the US and Israel. Moreover, it states that missions are not complete until they are publicised by a compliant and credulous foreign media, in particular the BBC Persian Service. The narrator talks of the ideas instilled by Saddam being “grounded firmly into the Arab psyche”, implying that Arabs are an enemy within and inherently untrustworthy. Such racist assumptions have underpinned the regime’s policy of discrimination against Arab citizens. The documentary infantilises Arabs, suggesting that unrest in the region is due to Arab tribes fighting each other “to secure their interests” rather than the regime’s often violent persecution of the Arab population. Prisoners interviewed and accused of indiscriminate murder or as accessories to murder include Idan Beit-Saddah, Kaled Obeidawi, Sajjad Beit Abdullah, Maher Chabi, Hassan Abayat, Ahmad Dabat and Jasem Saedi, all of whom have been arrested over the past few months and detained without charge. The regime claims to have miraculously “deprogrammed” the individuals within weeks of incarceration. 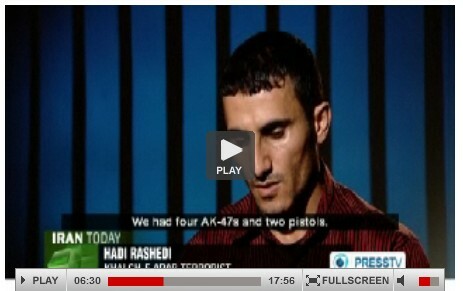 The documentary is not the first Press TV has broadcast parroting the regime’s bizarre conspiracy theories about the Ahwazi Arabs and the reasons for increasing unrest. Last December, before it was taken off-air in the UK for violating the broadcasting code, Press TV aired forced confessions from three Ahwazi Arabs following months of incarceration in a secret Ministry of Intelligence detention centre. One of the men is now scheduled for execution on the basis of the report.